We just finished working with Lake Cook exteriors… They installed new siding windows and gutters. Work was done by three separate crews each specializing in an area. The work was done in a timely manner, all orchestrated by Bill, the owner. He took care of each issue as it occurred, saving time and money. They made us feel like they really cared about us and our happiness, not just getting the job done. Needless to say we would highly recommend Lake Cook Exteriors. Above all, we believe they are honest sincere and competitive in price. Don was excellent to work with every step of the way. Very knowledgeable, responsive, and flexible. His ability to coordinate the install schedule to accommodate our painting crew and mother nature was much appreciated. If I have the opportunity to refer business I will do so with confidence. I appreciate the ease of doing business with you. This window job is our second major service from Lake Cook exteriors we previously did siding. And I'm glad I can patronize a truly local business with confidence. Very pleased with the work and the entire process from bid to billing. Workers were incredible - early a.m. to early evening to get the job done and the workmanship excellent. Courteous and cooperative with the quality finish and offers a follow up if needed. Pleasure working with Lake Cook Exteriors Inc.
We were very happy with Bill, he was knowledgeable and pleasant to deal with. He went out of his way to accommodate our needs. The workmanship and the product is excellent. They did our siding and gutters. They were very thorough and completed the job on schedule. I would recommend Lake Cook Exteriors to anyone needing their services. Bill was awesome! 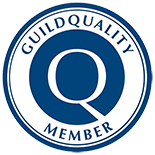 You can't beat this company for honest, hard-working, ethical and professional work. Very happy with the job. It's hard to find companies like this today that still care about the work they do and their customers satisfaction. This is the second job they have done for us. Thanks Lake Cook. Excellent work. Don was very responsive to all inquiries. Work crew arrived when expected and completed the job in about six hours. They asked questions as needed to make sure we would be satisfied. They cleaned up thoroughly after completing the job. We were very pleased with the job they did. This year I decided to work on a much larger project to remove the cedar shake on my home and replace with siding. Both Don and Bill were very helpful, answered all my questions, provided me with samples and suggestions of options. I am extremely satisfied with the workmanship of the installation. My house looks brand-new. I have received numerous compliments from neighbors and friends. I would recommend Lake Cook Exteriors for gutter work. It is a local business which is an important factor. We must support locally. Don Tenuto was courteous and informative. He did his best to have the job done at the first opportunity. I trust that the workmanship is of good quality. I wish Lake Cook Exteriors on going success. Lake Cook Exteriors is the most professional and able small company with which I have ever worked. It would have been impossible to come closer to meeting my needs from providing an estimate through completed installation (of my windows). They provide a perfect service. Michael G. Mt. Prospect, IL. The team at Lake Cook Exteriors were excellent in every category. They provided an estimate for gutters and downspouts that was detailed and understandable. The house is large with some complicated soffit and gutter angles and downspout needs. Lake Cook's estimate took these complications into account. The bid was very competitive the team answered all of our questions. The workers came exactly as scheduled and stayed exactly as long as predicted. The work was performed on time, the workers were courteous and cleaned up perfectly and the results were exactly what we wanted. Highly recommended! John M. Buffalo Grove, IL. Don walked the job with me and explained in great detail what needed to be done. He provided references and samples. His crew was hard working, neat and polite. The result was an excellent job which enhanced the look of my home with a competitive price. We appreciate your fine work. Everything was done with professionalism and it was out pleasure to work with you. It isn't my habit to write referral letters like this one, but yours is an exceptionally fine company. Everything was perfect-quality work, straight talk and timely response. Don came out immediately and gave me an estimate. Workers arrived as scheduled and got the job done in no time. Bill even came out to discuss potential future upgrades to the house. Even the billing procedure was smooth, no hassles. Everyone was very friendly, I couldn't be happier. Thanks again for another great job! I was very pleased with the window installation-same great work ethic as I remembered from my front door installation, which, by the way, I am still getting complements on. Joe and Debra M. Schaumburg, IL. 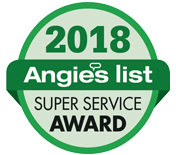 We would like to take this opportunity to compliment you and your company for the outstanding job you did on our siding, gutters, roof vents, flashing and windows. The contractors you hired were supurb, polite and courteous. Your siding installer was so professional and precise at every angle. Everything went exactly as planned, when promised and without a hitch. There was no problems whatsoever, Bill you made sure of that. You can out everyday to make sure things were going exactly the way we wanted them to be and they were. The house looks beautiful! We are so glad we went with Lake Cook Exteriors and we would highly recommend this company to everyone! Thanks again for a job well done! I would definitely recommend Lake Cook Exteriors! The bidding proposal process was quick and painless. The price came lower than four other companies and I belive the windows are better quality as well. Bill never haggled or pressured us, that was very important to me. All in all, it was really a great experience and we love our new windows! Thanks for a job well done. From the initial survey and subsequent product selection to final installation and follow-up, everything was top notch and very professionally handled. Brian & Debbie O. Buffalo Grove, IL. 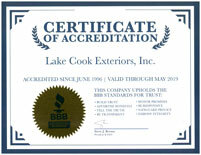 Doing business with Lake Cook Exteriors was truly a pleasure. They sell very good products, we purchased Simonton windows, Albany doors and Pella storm doors at a very competitive prices. Bill Sheetz was very knowledgable and extremely honest. There was no doubt in our minds that we received the best value for the price we paid and he went out of his way to satisfy us. Russ & Michelle M. Hoffman Estates, IL. Thank you very much to you and your crew for doing such a great job! We appreciate and are very pleased with the service, time and talent that you, Bolik and Michael gave to our home. They were very nice, professional and hard working from start to finish. We highly recommend you and your company to anyone looking to improve their home. The price was right and the job was very well done.